Characteristics of posture and movement in a unicycle may cause Femoroacetabular impingement and premature osteoarthritis. 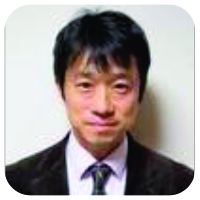 Department of Orthopedic Surgery, Hamamatsu University School of Medicine, Shizuoka Prefecture, Japan. 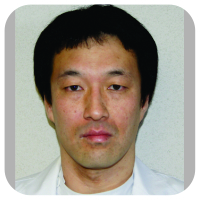 Department of Orthopedic Surgery, Hamamatsu University School of Medicine, Shizuoka, Japan. Introduction: Although an association between femoroacetabular impingement (FAI) and sports has been reported, there are no reports regarding arthroscopic findings of osteoarthritis due to FAI in adolescent unicyclists. Case Report: We present three cases of experienced unicyclists with coxarthrosis at puberty (three girls aged 17, 15, and 12 years). 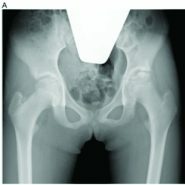 All three girls had bone morphology characteristics of FAI (two unicyclists with cam-type FAI and one with mixed-type FAI). None of them had a history of trauma or abnormal blood test result. The patients underwent hip arthroscopic surgery and intra-articular evaluation/treatment (acetabular labral repair, synovectomy, bone marrow stimulation [microfracture], and capsular closure). Arthroscopic findings included severe and extensive cartilage and acetabular labrum damages. After surgery, only two patients were able to return to competition. The characteristics of the unicycle competition may have led to puberty coxarthrosis due to FAI. Conclusion: Hip joint symptoms in adolescent unicyclists have a risk for causing severe and extensive damages to the labrum and articular cartilages at an early stage, thereby requiring preventive and attention-seeking measures. Keywords: Unicycling, premature osteoarthritis, hip arthroscopy. An association between sports and femoroacetabular impingement (FAI) has been observed. In particular, cam lesions have been reported to be a risk factor for coxalgia, chondral damage, and osteoarthritis (OA) onset [1, 2, 3, 4].Only one previous study has reported regarding the association between unicycling and OA onset ; for the first time, we report regarding hip arthroscopic surgery performed in three unicyclists who were diagnosed with premature OA of the hip. A 17-year-old girl with no history of trauma began unicycling at the age of 7 years. Pain began in her right hip joint 46 months after she started competitive unicycling. Conservative therapy at another hospital included training for non-weight-bearing walking. She was referred to our hospital because her symptoms did not improve. Her initial examination was conducted 60 months after the pain began. Plain radiographs revealed OA changes in the right hip joint, such as osteosclerosis, joint space narrowing (JSN), and bone cysts(Fig. 1a). The a angles were 75° (cross-tablelateral; Fig. 1b) and 71° (modified Dunn view ; Fig. 1c). Cam lesions were found in the femoral head-neck junction. The lateral center-edge angle(LCEA)was 29°. No clear OA changes were observed on the healthy side. As for the range of motion (ROM), flexion and internal rotation of the right hip joint were limited. 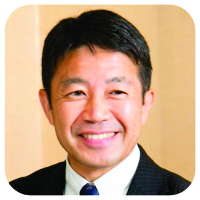 The anterior impingement test result was positive. The diagnosis was premature OA of the hip joint due to cam-type FAI. Hip arthroscopic surgery was performed. The geographic zone method was used to describe the lesion size . 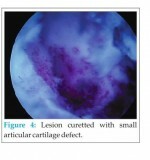 The International Cartilage Repair Society (ICRS) classification was used to assess lesion severity. Chondral lesions were observed in the acetabular side, zone 3 (ICRS Grade 3) and femoral head side, zone 3 (ICRS Grade 1; Fig. 1d). Extensive acetabular labral damage was found across zones 2–4. The labral–chondral transition zone cartilage was MAHORN classification Grade 3 (Fig. 1e). Labral repair, cam osteoplasty (Fig. 1f and g), and capsular closure were performed. At 18 months postoperatively, plain radiography revealed no progression of OA changes. She had complete recovery and thus returned to competitive unicycling. Improvement in the modified Harris hip score was 14 points (from 76 points preoperatively to 90 points postoperatively). A 15-year-old girl with no history of trauma began unicycling at 7 years of age. The left hip pain began 72 months after she started competitive unicycling. Conservative therapy, including non-weight-bearing walking training, was performed at another hospital. However, because her symptoms did not improve, she was referred to our hospital. Her initial examination was conducted 16 months after the pain began. Plain radiographs revealed OA changes in the right hip joint such as osteosclerosis, JSN, and bone cysts. The a angle was 71° (cross-tablelateral). Cam lesions were observed at the femoral head-neck junction. LCEA was 33°. There were no clear OA lesions on the healthy side. As for ROM, flexion and internal rotation of the left hip joint were limited. The anterior impingement test result was positive. The diagnosis was premature OA of the hip joint due to cam-type FAI. Hip arthroscopic surgery was performed. Chondral damage was observed in the acetabular side, zone 3 (ICRS Grade 3) and femoral head side, zone 3(ICRS Grade 3). There was labral damage in zones 2 and 3 but no clear detachment. The labral–chondral transition zone cartilage was MAHORN classification Grade 1. Labral repair, camosteoplasty, and capsular closure were performed. At 30 months postoperatively, plain radiographs revealed slight JSN. There was no hip joint pain aggravation. She had complete recovery and thus returned to competitive unicycling. Improvement in the modified Harris hip score was 17 points (from 71 points preoperatively to 88 points postoperatively). A 12-year-old girl with no history of trauma began unicycling at 9 years of age. The left hip pain began 30 months after starting competitive unicycling. At another hospital, plain radiographs revealed abnormal findings, and she was referred to our hospital. Her initial examination was conducted approximately 7months after the pain began. Plain radiographs revealed OA changes of osteosclerosis, JSN, and bone cysts in the left hip joint. Shenton’s line was irregular (Fig. 2a). The a angle was 58° (cross-tablelateral), and cam lesions were observed in the femoral head-neck junction. LCEA was 26°, but plain radiographs at the initial examination already revealed external femoral head displacement. LCEA was 40° on the healthy side, and there were no clear OA changes. Computed tomography revealed acetabular retroversion (anteversion angle,-4°). As for ROM, flexion and internal rotation of the left hip joint were limited, and the anterior impingement test result was positive. The diagnosis was premature OA of the hip joint due to mixed-type FAI. Hip arthroscopic surgery was performed. Chondral damage was found in the acetabular side, zone 3 (ICRS Grade 4) and zones 2 and 4 (ICRS Grade 1; Fig. 2b) and femoral head side, zone 3 (ICRS Grade 4;Fig. 2c). The labral damage extended to zones 2–3 and was mildly degenerated. The labral–chondral transition zone cartilage was MAHORN classification Grade 3. 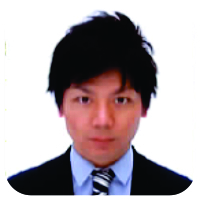 Labral repair, microfracture surgery, and capsular closure were performed. Plain radiographs performed 3 months postoperatively revealed progression of OA changes (Fig. 2d). The symptoms have shown little improvement, and she has not been able to return to competitive unicycling. Improvement in the modified Harris hip score was 2 points (from 71 points preoperatively to 73 points postoperatively). Although an association between FAI and sports has been reported, only one study (two cases) has reported regarding the association between unicycling and OA onset. There are no reports regarding arthroscopic findings of OA due to FAI in adolescent unicyclists. 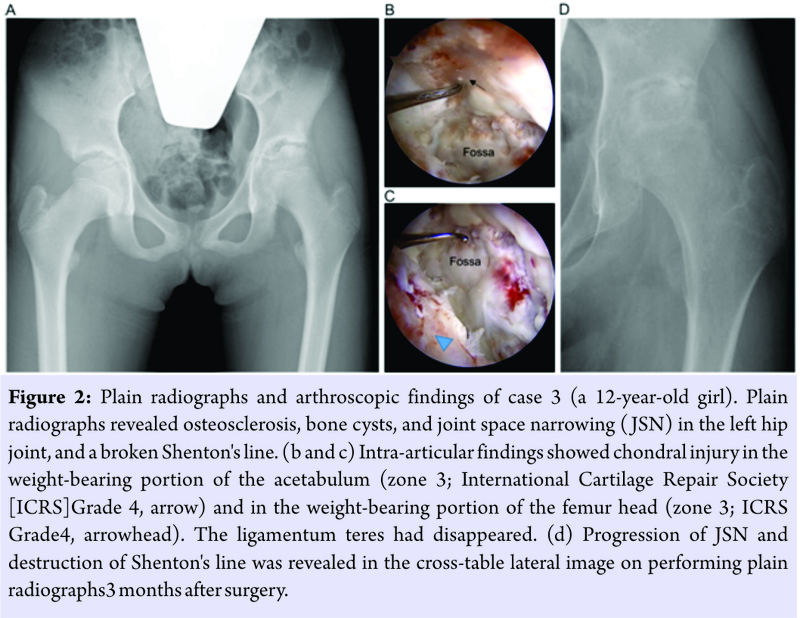 We treated three cases of premature OA of the hip joint due to FAI in pubescent unicyclists. Blood tests revealed no abnormal findings, and there were no trauma history and primary diseases in any unicyclist. Two unicyclists had cam-type FAI and one had mixed-type FAI. Thinning of the ligamentum teres was observed in cases 1 and 2, and the ligamentum teres was completely absent in case 3. Johnston et al. examined a angles and intra-articular findings and reported that the greater is the a angle, the more prone is an individual to having labral or acetabular chondral damage. Agricola et al. reported that regarding the association between cam lesions and OA changes, a angles of =60° increase the risk for OA onset at an odds ratio of 3.67. Kaya et al. noted the association between ligamentum teres tear and acetabular chondral damage. Because all three of our unicyclists had cam lesions and dysfunction of the ligamentum teres, it is reasonable to state that OA occurred. However, it is remarkable that OA occurred in all three unicyclists during puberty, over a short period after initiating competitive unicycling, and in those involved in the same sport. This suggests that the characteristics of unicycling have a role in the disease onset. There are approximately 6000 unicyclists participating at a competitive level in Japan. Most unicyclists are elementary to high school-aged children, and approximately 80% are girls. In contrast to bicycles, the number of pedal rotations is directly proportional to the number of wheel rotations. Therefore, unicyclists must pedal quickly to increase unicycle speed and lean forward to move forward. Unicycling is divided into two categories: Artistic performance and track events, where athletes compete for speed. When children first start unicycling, they typically practice both categories. Therefore, their hips are often in the forward-leaning positions to increase speed or maintain an esthetic posture. In this pelvic position, repeating fast pedaling motion may cause FAI and leads to labral and chondral damage. Furthermore, compression force to a hip joint might influence chondral damage and OA onset. The outcomes of hip arthroscopic surgery largely depend on chondral damage severity. Baba et al. 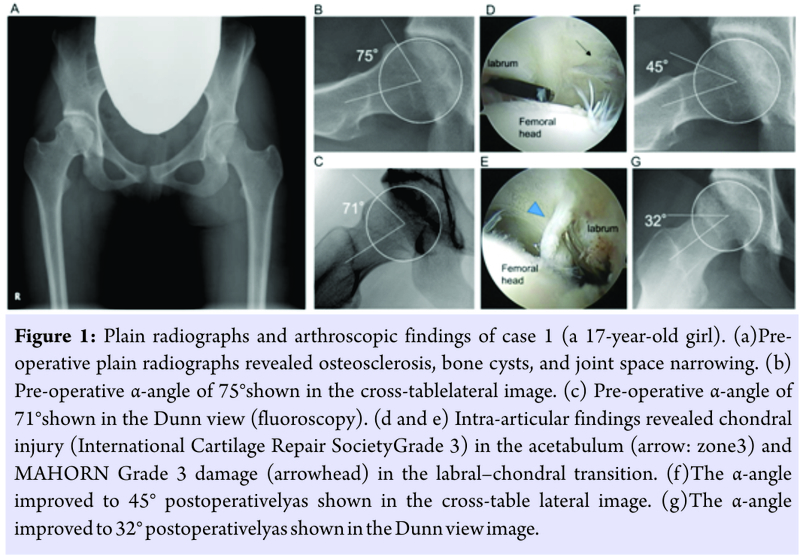 performed varus osteotomy for OA of the hip due to pincer-type FAI in pubescent unicyclists. In contrast, we performed hip arthroscopic surgery as an initial therapeutic and diagnostic intervention to understand the intra-articular lesion and plan the best treatment. The intra-articular findings allowed us to confirm that chondral damage was more severe and extensive than expected. Our three cases have demonstrated the risks for developing FAI due to the characteristics of unicycling, which induces the early onset of OA. Our findings suggest the need to warn athletes and instructors regarding these risks and establish OA onset prevention programs in the future. We concluded that these pathologies derived from unicycling performance were involved in OA onset. It is notable that in all our cases, OA onset occurred only on the side of the pivoting leg, suggesting that mechanical overload caused by acceleration and rotation speeds is involved in OA etiology in some cases of young unicyclists. The young unicyclists have the risks for FAI development due to the characteristics of unicycling, which induces early onset of OA. Our findings suggest the need to warn athletes and instructors of the risks and establish OA onset prevention programs in the future. 1. Vingard E, Alfredsson L, Goldie I, Hogstedt C. Sport and the development of osteoarthritis of the hip. Am J Sports Med 1994;18:1-3. 2. Agricola R, Heijboer MP, Bierma-Zeinstra SM, Verhaar JA, Weinans H, Waarsing JH, et al. Cam impingement causes osteoarthritis of the hip: A nationwide prospective cohort study (CHECK). Ann Rheum Dis 2013;72:918-23. 3. Ganz R, Parvizi J, Beck M, Leunig M, Nötzli H, Siebenrock KA, et al. Femoroacetabular impingement: A cause for osteoarthritis of the hip. Clin Orthop Relat Res 2003;417:112-20. 4. Reichenbach S, Leunig M, Werlen S, Nüesch E, Pfirrmann CW, Bonel H, et al. Association between cam-type deformities and magnetic resonance imaging-detected structural hip damage: A cross-sectional study in young men. Arthritis Rheum 2011;63:4023-230. 5. Baba T, Shitoto K, Kaneko K, Kim S, Maruyama Y. Premature osteoarthritis of the hip in unicyclists: Two case reports. Clin J Sport Med 2011;21:362-4. 6. Meyer DC, Beck M, Ellis T, Ganz R, Leunig M. Comparison of six radiographic projections to assess femoral head/neck asphericity. Clin Orthop Relat Res 2006;445:181-5. 7. Ilizaliturri VM Jr, Byrd JW, Sampson TG, Guanche CA, Philippon MJ, Kelly BT, et al. A geographic zone method to describe intra-articular pathology in hip arthroscopy: Cadaveric study and preliminary report. Arthroscopy 2008;24:534-9. 8. Safran MR, Hariri S. Hip arthroscopy assessment tools and outcomes. Oper Tech Orthop 2010;20:264-77. 9. Johnston TL, Schenker ML, Briggs KK, Philippon MJ. Relationship between offset angle alpha and hip chondral injury in femoroacetabular impingement. Arthroscopy 2008;24:669-75. 10. 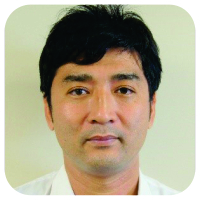 Kaya M, Suziki T, Minowa T, Yamashita T. Ligamentum teres injury is associated with the articular damage pattern in patients with femoroacetabular impingement. Arthroscopy 2014;30:1582-7. How to Cite This Article: Nishikino S, Hoshino H, Koyama H, Furuhashi H, Matsuyama Y. Hip arthroscopic Surgery after a Diagnosis of Premature Osteoarthritis of the Hip in Three Unicyclists: A Case Series. Journal of Orthopaedic Case Reports 2018. May- June; 8(3): 51-54.